Starting problems with your lawn mower fall into 2 basic causes: fuel problems and ignition problems. The following is a simple checklist you can follow to help isolate a possible cause. This is not an exhaustive guide and certainly not a repair manual. However, there a few steps you can take before taking it to the repair shop for a thorough fix. This is the first and most obvious thing to check, especially if you weren't having startup problems last year. Be sure that the machine has an ample supply of fresh fuel. It's amazing how often people will get their mower out of cold storage the first warm day in spring and find their mower just won't start. Forgetting that they left the fuel in the tank from the previous year. Today's fuels don't age well. In fact today's gasoline is much like milk and starts to go bad quickly, often in as short a period as 60 days. Make sure that the ignition switch is "on", that all attachments are disengaged and that the transmission is in neutral. Most machines have safety mechanisms that will not allow them to start otherwise. Consult your owner's manual for the starting procedure for your machine. Make sure the spark plug wire is firmly attached to the spark plug. If it still doesn't start, check for a spark by removing the spark plug and grounding the "hex" part of the spark plug to a bare metal part of the engine. Remove any spilled gasoline that is nearby first, then spin the engine by pulling the rope or turning the key. You should see a blue spark jump across the plug gap. If you have a good hot spark, skip to the carburetor section. lf the spark is yellow and weak, or there is no spark then the first thing to do is try a new spark plug. Don't try cleaning the old one. Set the new plug gap to the proper spec (usually 0.030") and check for spark again. If you do see a spark, install the new plug and try to start the machine. If there's still no spark, try cleaning and setting the points on older machines, or replacing the electronic ignition module on newer machines. Before replacing the old module test it by disconnecting all the wires from the module terminal that connect to the kill switches and recheck for spark, if you do see a spark then a wire or switch is probably defective. Also check the flywheel key. That affects the spark timing, usually the key will need replacing if you strike something while mowing and the engine stops. If the fuel is fresh, you have a good spark and still won't start, you must make sure that fresh gasoline is getting to the carburetor. Make sure that the fuel shutoff valve (if present) is opened, and that the fuel line is not plugged or kinked. Also be sure the fuel cap vent is open and any screens in the tank are clear of debris. If fuel can flow to the carburetor, carefully place 1 teaspoon of gasoline down the spark plug hole (or a add shot of starting fluid into the carburetor throat). Re-tighten the plug and try to start the machine. 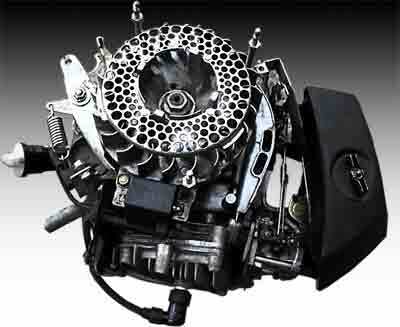 If it runs for a second or two, then quits, chances are the carburetor needs to be serviced (disassembled and cleaned & inspected, then rebuilt) or you have an air leak somewhere. Make sure all mounting screws or bolts are snug and gaskets are not missing sections. If the carburetor is a bowl-type check for water in the bottom of the bowl (but do not let the float swing all the way down or the float needle will fall out!). Hopefully, this will give you a little insight in what to look for if your mower won't start. Most starting problems are fuel related because the previous year's fuel wasn't removed. You may have gone years without removing the fuel at the end of the year without having any starting problems. There is a chemical process called varnishing that puts a coating on the inside workings of your fuel system. Over time this process continually worsens until your system becomes inoperable. Gasoline can ignite very easily. Work only in well-ventilated areas and away from sources of heat, sparks, and flames. Always wear safety glasses, and be careful of sharp blades. Keep a fire extinguisher nearby.